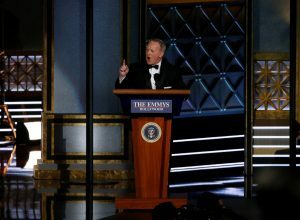 Colbert’s direct shot at the president was just one of the ways politics made its way into Sunday’s television awards, from nods to the cut-throat Washington drama “House of Cards” to Alec Baldwin’s infamous impersonation on “Saturday Night Live.” Former White House press secretary Sean Spicer, who has been satirized by Melissa McCarthy on SNL, made a surprise cameo at the awards, spoofing his post-inauguration assertions by saying that the 2017 awards show would draw “the largest audience to witness an Emmys, period — both in person and around the world.” His appearance sparked controversy, with Twitter users berating the Emmys for making light of or redeeming Spicer’s behavior as a Trump official. Lena Waithe was the first black woman to win an Emmy for comedy writing. She shares the award for an episode of Netflix’s “Master of None” with Aziz Ansari. Donald Glover, creator of “Atlanta” on FX, became the first black director of a comedy series to win the category. Glover also won as the lead actor in a comedy series, which has been awarded exclusively to white actors for the past 32 years. Julia Louis-Dreyfus won her sixth consecutive lead acting Emmy for HBO political comedy “Veep,” a new record. And “Saturday Night Live,” home to some of the most visible political comedy of the past year, was the biggest winner with nine victories. Editor’s Note: The number of awards won by Saturday Night Live was incorrectly reported as four; the show won nine awards.